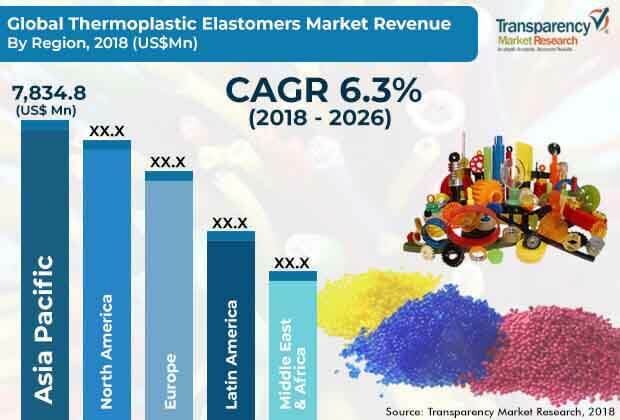 The global thermoplastic elastomers market was valued at around US$ 16,000.0 Mn in 2017 and is anticipated to expand at a CAGR of more than 6.0% from 2018 to 2026, according to a new research report published by Transparency Market Research (TMR) titled ‘Thermoplastic Elastomers Market – Global Industry Analysis, Size, Share, Growth, Trends, and Forecast, 2018–2026.’ The global thermoplastic elastomers market is driven by rise in the demand for thermoplastic elastomers in automotive applications such as car exteriors, bumpers, wires and cables, and door trims. The thermoplastic elastomers market in Asia Pacific is expected to expand at a CAGR of around 7.0% during the forecast period. Characteristics of thermoplastic elastomers such as high dimensional stability, chemical inertness, vapor and gas transmission properties, and flexibility are estimated to boost the demand for these elastomers in automotive, medical, and building & construction industries during the forecast period. Thermoplastic elastomers can be customized as per the specific needs of each medical application. Medical devices are frequently exposed to a variety of liquids and fluids that reduce effectiveness of these devices. In order to avoid this, medical equipment manufacturers prefer using thermoplastic elastomer materials over latex, PVC, and phthalate-based materials. As thermoplastic elastomers are resistant to chemicals, they are expected to be used on a large scale in medical devices during the forecast period. Thermoplastic elastomers are widely used in seals, closures, caps, prosthetic cushions, tubing (drainage and peristaltic pumps), surgical positioners, anti-slip grip handles or surfaces, training models, tourniquets, dental and medical hoods, and masks. Demand for thermoplastic elastomers for use in medical devices is projected to increase in the next few years, owing to their excellent recyclability, elasticity, flexibility, and high barrier properties. Thermoplastic elastomers are largely used in the automotive industry. They are increasingly replacing conventional elastomers and standard plastics in the automobile sector, owing to their dynamic properties. Thermoplastic elastomers offer a combination of elastic and thermoplastic properties, which has led to rise in their popularity and usage in the automotive industry. Thermoplastic elastomers are widely used in bumper fascia, interior trim, skins, boots/bellows, hoses, short air ducts, body/glazing seals, airbag doors, grommets, sleeves, door sills, over-molded films, shift knobs, lamp seals, slush molding, wires and cables, and soft-touch trim panels. Hard plastics or rubber-containing PVCs are being gradually phased out by a few automakers, owing to environment-related and legislative concerns. Consequently, these hard plastics or rubber-containing PVCs are being replaced by soft-touch thermoplastic elastomers. The paradigm shift in terms of preference for thermoplastic elastomers over conventional elastomers and standard plastics among automotive OEMs is likely to drive the global thermoplastic elastomers market during the forecast period. Rise in usage of thermoplastic elastomers in automotive components led by their exceptional attributes is projected to boost the demand for thermoplastic elastomers during the forecast period. Based on region, the global thermoplastic elastomers market has been segmented into North America, Europe, Asia Pacific, Latin America, and Middle East & Africa. In terms of value, Asia Pacific led the global thermoplastic elastomers market in 2017. China accounted for a major share of the market in the region in 2017, owing to high rate of adoption of thermoplastic elastomers in automotive OEMs. Increase in the production of automotive components in emerging markets such as China, India, Thailand, and Vietnam is driving the thermoplastic elastomers market in Asia Pacific. Increase in production capacities by existing manufacturers of medical devices in China and Japan is anticipated to boost the demand for extruded thermoplastic elastomers in the near future. Asia Pacific is a manufacturing hub of thermoplastic elastomers, accounting for more than 50% of the global production. Availability of raw materials such as thermoplastic resins at relatively low prices is expected to drive the market in the region in the near future. Furthermore, prominent players are focusing on expanding their production facilities in the Asia Pacific region to meet the surging demand for thermoplastic elastomers from the automotive industry in the region. The thermoplastic elastomers market in North America and Europe is likely to expand at a moderate pace during the forecast period. In terms of production of thermoplastic elastomers, the U.S. is expected to gradually increase its production compared to that of China in the next few years, on account of the rising demand for thermoplastic elastomers in automotive and medical applications in the country. Key players operating in the global thermoplastic elastomers market are Exxon Mobil Corporation, Covestro, Huntsman Corporation, BASF SE, E.I. du Pont de Nemours and Company, Celenese Corporation, PolyOne Corporation, Arkema Group, SABIC, and KRATON Corporation. These players are focusing on acquisitions and strategic collaborations in order to gain market share.